What began as an ostensible trademark dispute over the UCLA Bruin logo, as noted in an earlier post, is becoming a bigger thing. * It's likely to come up at the Regents meeting next week, at least in public comments, as it did at the last Regents meeting in September. 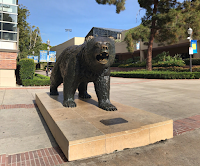 Oddly, as of 7 AM today, yours truly could find nothing about this controversy on the Daily Bruin website.